REVIEW - Gauntlet: Slayer Edition - Use a Potion! Ask anyone who paid a visit to videogame arcades in the 80s about their favourite coin-op games and you can guarantee Gauntlet will be mentioned. Of course, why wouldn’t it be? 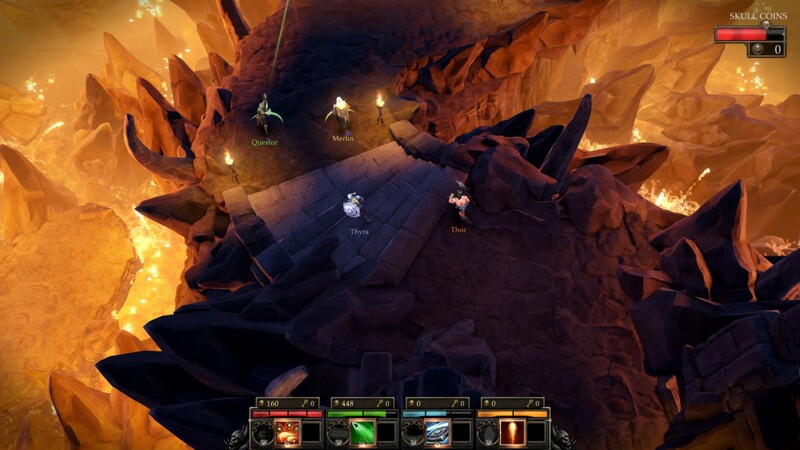 The four player dungeon crawler offered players the opportunity to work together, hacking and slashing at multiples of enemies as they look to escape each deadly floor. That was back in the 80s though. Although they tried to modernise the Gauntlet franchise, Midway never had that much critical success – they couldn’t quite take that classic formula and evolve it with modern gameplay. Midway themselves closed back in 2009 but fortunately Warner Bros. Interactive Entertainment took over the rights for their IPs, including Gauntlet. That led to this release from Arrowhead Game Studios; a modernised Gauntlet that sticks to the classic gameplay that we loved all those years ago. It released last year on PC to decent reviews – now it’s getting a re-release on Playstation 4, dubbed Gauntlet: Slayer Edition. With a variety of improvements over the original release the question remains – is it worth re-visiting the classic franchise or has it lost its place with duneon crawling hack and slashers in abundance these days? Gauntlet isn’t really a narrative driven experience. There is a bit of a background story with the Wizard Morek inviting you to survive the deadly dungeon he has summoned, but it’s not vital to the game and never really fleshes out. It doesn’t matter though; Gauntlet is a game that focuses on its arcade style gameplay rather than a rich lore. The game sees you traverse through a profusion of floors in a dungeon, each floor carrying a different aesthetic design ranging from a mummy’s catacombs, macabre crypts to lava spitting caverns. Each area you explore is part defined map, part procedurally generated so each floor of the dungeon will be different every time. The environments look fantastic – with the top down perspective on the areas you can see all the tiny details Arrowhead Game Studios have made to each different style of area you visit. You’ll get absorbed into the environments, making you really like you’re exploring a mummy’s tomb, or that you’re fighting through a giant spider’s nest; environmental designs are very effective and engage the player in these dangerous dungeons. The lighting effects really add to the atmosphere of the perilous dungeons too – those flickering embers of light can be dimmed away though with your wayward attacks extinguishing burning candles, so don’t take too much solace in these brightly lit areas. Despite their attractive looks the environments can start to look a bit samey as you progress. Whilst the style does change you’re left exploring new floors that don’t always differentiate from the previous floor you were on. Of course the dungeons aren’t the most important aspect of Gauntlet, but rather the quartet of iconic heroes that the games lets you take the role of; the Warrior, the Valkyrie, the Elf or the Wizard, each character offering their own unique style of play. The Warrior is the strongest of the quartet, the one who gets up close and personal in dispatching foes. With a variety of attacks that includes a spinning move that deals great damage to all enemies within his range, the warrior is great when it comes to straight up melee. Whilst the Warrior is a master in attack, the Valkyrie’s strength is with her defence, her shield able to protect her from prolonged enemy attacks. With a decent standard attack and the ability to lunge her shield at foes she is a smart choice for those who like to dig in with close quarter battles but also offering a bit of safety with her shield. 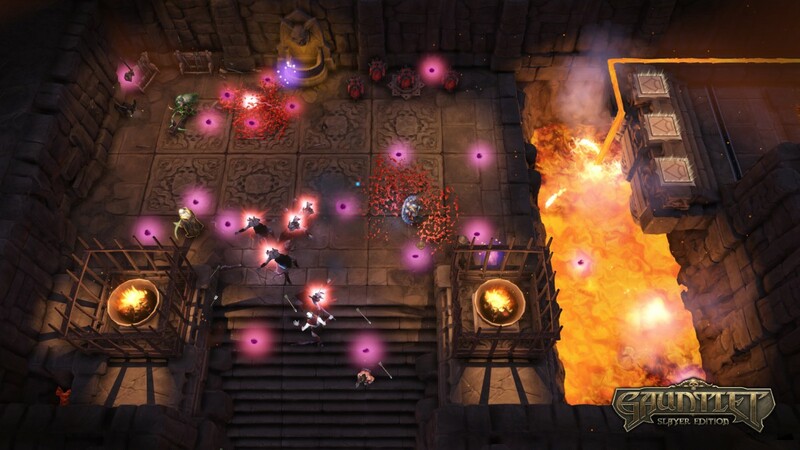 When controlling the Elf, Gauntlet feels like a whole new different game – a twin stick shooter. You control the Elf with the left stick whilst guiding his infinite supply fleeting arrows with the right stick. It works very fluidly and I found he was actually my favourite character to control. He also has faster movement than the others, with the ability to dodge roll away from ghastly situations coming into great use. He can also drop bombs too – highly effective when taking out groups of enemies. Are you a fan of conjuring up deadly spells to wipe out your foes? Then the Wizard is for you. Akin to the Elf, the Wizard feels like you are playing a different game compared to the other characters – each attack is performed through the use of different button combinations, each combination offering a different spell be it fire projectiles, lightning barriers or much more. He is certainly one of the more flexible characters to play as, but you will need a mastery of those spell combinations if you’re going to put him to his best use. Each character is a pleasure to control – every player will find a character that suits their own style of play. You’re also able to upgrade your characters, be it through different weapons that offer new special attacks or through relics that offer you power ups in different ways. 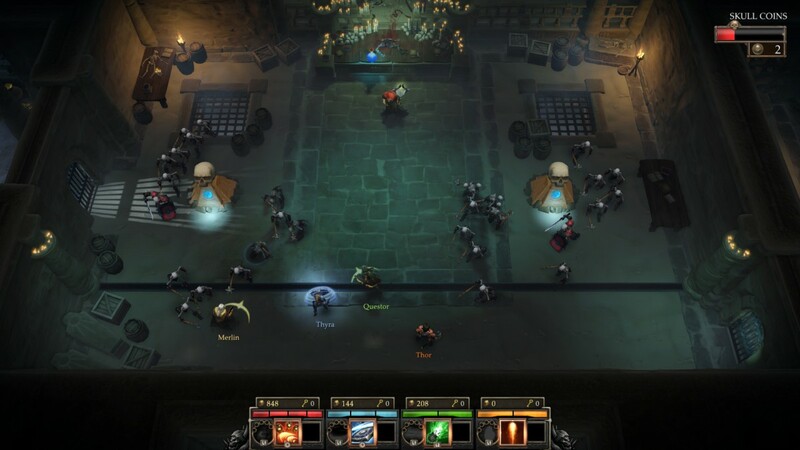 The new slayer edition actually offers extra upgrade options including attacks and potion abilities – these weren’t available in the original release so the game offers that bit extra to players looking to revisit the game. These upgrades can be bought from the gold that you gain through each dungeon whilst some upgrades require unlocking through the games ‘mastery’ system. The ‘mastery’ system has you meeting different criteria to unlock different abilities. These criteria vary though and are often entertaining; you have your standard ‘defeat x amount of enemy’ objectives, but there’s also others such as ‘die by spike attacks’ or ‘die 100 times’ – whilst typically unconventional in videogames, death has rewards in Gauntlet. There are also class specific masteries to unlock, giving you that extra incentive to play as each character if you fancied a change from your normal choice. Whilst upgrading is useful and adds a bit of creativity to suit your play style, a lot of it is just cosmetic changes. The prices for upgrades are also quite hefty – it’ll take quite a lot of dungeon crawling and monster slaying if you want to unlock every upgrade or modification for your character. Fortunately the monster slaying is where the game really shines. You’ll encounter a vast amount of grotesque enemies along your way through the dungeon, each one offering different ways to kill you – and they WILL kill you. Gauntlet is not an easy game; you’ll be inundated with groups of respawning enemies looking for blood. The game takes quick thinking and prioritising – with enemies respawning from summoning stones it’s important to take those out as soon as possible. I also liked that some enemies spawned from a heap of bones, a nod to the original arcade release. Combat really is enjoyable though. You’ll constantly find yourself in the same sort of scenarios with enemies constantly respawning and pursuing you, but it never gets dull because the game is just so much fun to play. Boss fights, though few, were a treat to play through too– each one requires a different thought process to beat rather than constantly attacking. It adds variety to the combat – It’s just a shame there weren’t more boss fights in total. The new release offers a few new monster varieties along with improved visuals, animations and new attack patterns. Having not played the original release I’m not able to specify these new additions – all the monsters were entertaining to battle though and offered plenty of challenge. I really enjoyed the variety of design too – even if the far out camera angles meant that sometimes you didn’t really get to take a close look at the character models. The sound design of the game is great – the sound effects as you massacre your enemies (or indeed meet your own death) are fantastic. The voice acting is entertaining too – whilst the one line quips your character makes whilst playing single player offer a few laughs, the banter between characters in multiplayer is a real treat. The game also brings back an announcer to the game similar to the original release. Whilst it doesn’t have the same effect as the original release with remarks like ‘Warrior needs food badly’, it’s still something series veterans will appreciate. The game would have benefited for search options for the online multiplayer though – whilst I never struggled to find someone to play with online I wasn’t always able to play as my class of choice (the Elf). A refined search option to find games looking for specific classes or on a specific level would make it easier for the player to find a game that meets their needs. Arrowhead Game Studios have took the Gauntlet series and brought it to modern gamers. Whilst they haven’t really evolved the series, or even the genre as a whole, the new approach to the classic formula offers plenty for series veterans as well as newcomers. 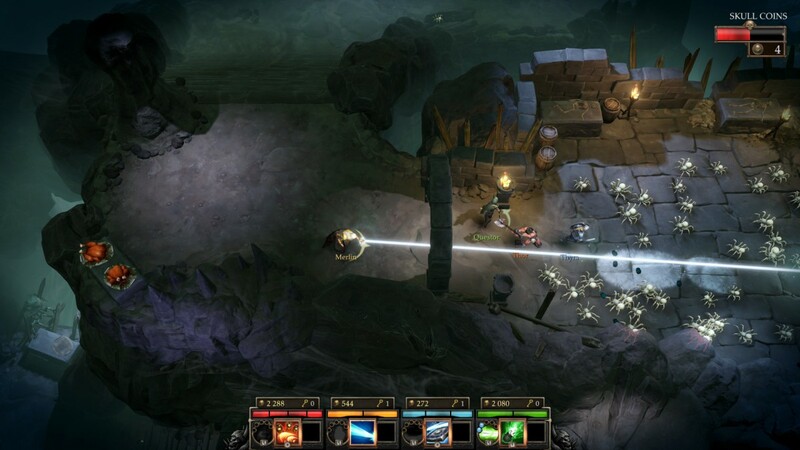 The well designed environments, although somewhat repetitive, are a treat to venture through and slaying enemy after enemy has a sense of satisfaction to it – especially with the variety of enemy on offer. Each character you can play as also offers a different dimension to the gameplay; there aren’t many games where each character choice makes you feel like you are playing a different game. I didn’t play the original edition of the game so maybe I didn’t appreciate some of the changes the developers brought like improved visuals or the difficult rebalancing. I can say that the game is fantastic to look at and definitely provides a stern challenge without being unfair. The extra game modes such as ‘endless mode’ and daily ‘colosseum challenges’ are also enjoyable for those who seek new challenges after completing the campaign, a feat that can be achieved in roughly 6 hours (with many deaths along the way). Of course, the bravest of warriors could always take on the harder difficulty. Overall this latest entry is a great entry in the series and a game that deserves the Gauntlet name – the developers have done a fantastic job and it’s great that Warner Bros. have decided to revive this classic series – the classic Midway IPs are certainly in good hands. Here’s hoping that we’ll see other arcade classics revived soon!